If you weren’t already exhausted by the constant stream of headlines regarding Greece’s inability to meet their financial obligations, you should be now! After more than five years of negotiations, deals, posturing and extensions, the situation in Greece seems to be coming to a head. I hesitate to use the word “crisis” because unless you’re living there and feeling the depressionary pain, this is really a fringe story. What I find interesting is that we are finally seeing all parties involved dig their heels in to play tough. This isn’t another Lehman Brothers. I am not worried about contagion like sub prime mortgages in 2007. I don’t fear counter party risk like with AIG. Greece’s creditors are at the top of the food chain where bailouts aren’t needed. I won’t rehash the past five years, but I have written many times that Greece has actually been in default more than they have been current in their obligations over their long history. This is cultural more than financial. For example, Greek citizens have a history of unprosecuted tax evasion. It’s accepted as business as usual. Their socialist system simply does not work. You can’t have a full pension retirement age of 57 when life expectancies continue to grow and your country has no means to pay those people. Over the weekend, two significant announcements were released. First, the Greek government scheduled a referendum for July 5th on whether to accept the new “deal” offered by its creditors. This is a very bold and fascinating move by Athens, essentially abdicating the decision to its citizens who have protested the deals in mass. They reject austerity. They reject raising taxes. They reject raising the retirement age. They reject pension cuts and reform. What they want is old fashioned business as usual, which has about as much a chance of happening as I do of becoming six feet tall! I am currently 5’8″. Besides the referendum, the Eurozone finance ministers refused to a one month payment extension and the European Central Bank (ECB) announced that they would not increase emergency liquidity measures for the Greek banks, essentially forcing their hands by saying enough is enough without further concessions. As you might expect, this caused an immediate run on the banks throughout the night and potential collapse in their entire banking system. And, as you might expect, the Greek government then shut down the banks at least until Thursday to stem the tide (NOT) and begin to put capital controls in place on withdrawals. So, what we have is a very high stakes games of chicken between Greece and the Troika. Troika being the ECB, IMF and European Union. Greece remains in a lose-lose situation. Continue to accept austerity measures and remain in a deflationary depression, which is a bit redundant. Or, tell the Troika to go pound sand, default on everything, leave the Euro and issue drachmas, which would send the country into some type of modern day inflationary spiral where imported goods would grind to a complete halt. Neither option seems appealing, but if I had to choose, I would take the latter, somewhat like Iceland did six years ago, except they had their own currency. Their stock market collapsed 90% along with their banking system and economy. However, five years later, the world was already loaning them money again and the recovery was brisk. The Troika fears Greece exiting the Euro because it sets the stage for other, much larger and more economically and financially important countries to leave, like Portugal, Spain and even Italy. That’s a story for later this decade. It’s a very busy week for the markets and economy coming off the ECB’s long anticipated announcement of Euro QE last week. On the one hand I thought it was smart to leak the $50B euros per month plan so that markets could digest it ahead of the official statement. It was also a great move to then exceed the number that was leaked by $10B euros. On the other hand, I am not in favor of this piecemeal approach when everyone already knows that $60B euros per month won’t be enough. If Mario Draghi was truly committed to QE and saving the euro “at any cost”, they would have pulled all stops and done the shock and awe of AT LEAST $100B euros per month right away. It would caught everyone off guard in a positive way except for those who are positioned against QE, exactly the folks the ECB is trying to combat. It would have sent such a powerful message to the markets. In one of the better telegraphed moves out of the European Central Bank, Mario Draghi & Company gave the market what it had been expecting, using some fairly heavy ammunition to provide stimulus to Europe’s struggling economy. He may not have gone to Hank Paulson’s bazooka just yet, but they are getting close! Thursday was a solid win for the bulls as the Dow, S&P 500, S&P 400 and Nasdaq 100 all scored new highs for 2014 with the lagging Russell 2000 leading the day in terms of price gains. A sore spot for the bears to focus on has been the lack of confirmation by most of the major indices, but that has all but been eliminated with just the small caps needing to catch up. Sector action was impressive across the board and the bulls continue to stampede each and every short-term opportunity, like the one I wrote about just two days ago. Some of the short-term concern remains with today’s employment report many times acting as a fulcrum for short-term move in the opposite direction. I may sound like a broken record, but until proven otherwise, all short-term pullbacks are buying opportunities. The bull market may be old and wrinkly, but very much alive. Unless 2014 is a precedent setter, the usual pieces for a bear market are simply not in place and even 10%+ corrections should lead to more all time highs. For today, a celebratory opening will offer the bulls a good spot to take some chips off the table, something I will consider for the first time in a long, long while. This bull market continues to be one of the most disavowed in my 25 year career. Investors seem to have this strong bearish anchor but temporarily get excited at new highs on news. That’s not a successful long-term strategy. Congratulations to President Barack Obama and all of the politicians who were elected by the American people last night. In the end, although my candidate did not win, Democracy was and is always the big winner. As you know, I hardly ever use the word “hope” when discussing investing, but in this case, I do hope we somehow see congress and the president at least genuinely attempt to work together on a bipartisan basis. I don’t know a single person who wants four more years like the last two in DC. I am going to be on FOX Business’ Markets Now at 1:30pm est today discussing the election results and its impact on the stock market and economy. 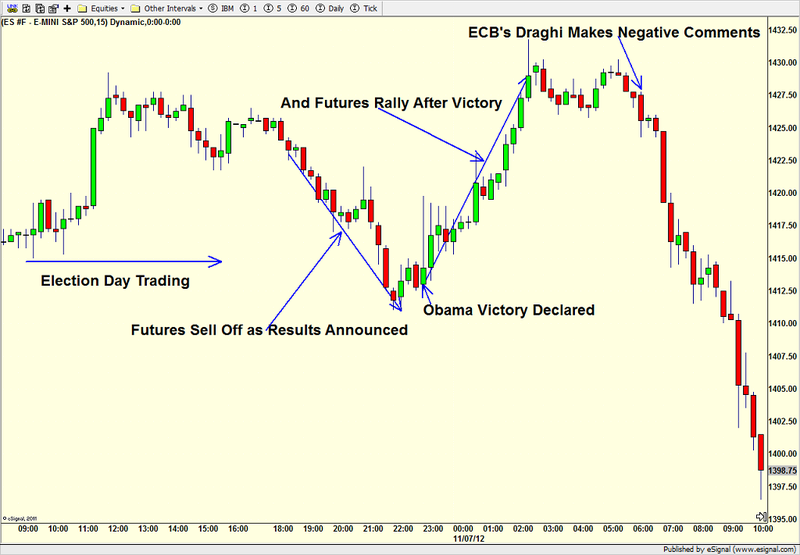 In yesterday’s Street$marts, (http://www.investfortomorrow.com/newsletter/CurrentStreet$marts20121106.pdf) I made the case that an Obama victory would see market upside and a Romney victory would see weakness. And that whatever the move was, it should continue into next week. So what’s going on today and why the sea of red in the stock market and the Dow now under 13,000? Stocks traded higher on Monday and Tuesday. Some say it was Romney, while others say it was Obama. To me, it’s irrelevant. You can see that last night from 5pm to 10pm, the S&P 500 futures (an indicator of the overall stock market) traded lower as the results were announced. After Obama achieved 270 electoral votes for reelection, the S&P 500 futures turned around and headed higher until almost 6am. So when I woke up and saw the green, I thought the market would open to the upside. That was until the European Central Bank’s Mario Draghi made negative comments about Germany’s economy weakening. From there, the futures fell sharply straight to the U.S. open at 9:30am and have continued lower ever since. 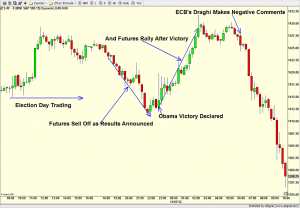 Was Obama’s reelection the cause of today’s carnage or was it the ECB? In the grand scheme, it doesn’t really matter, but given the weakness in the financials and materials and relative strength in consumer discretionary stocks, it certainly looks like Europe is the bigger driver than the election. I would look for the weakness in stocks, on balance, to continue into next week before another attempt at a meaningful bottom begins for a year-end rally. Markets breathed a collective sigh of relief after the German courts ruled “favorably”, allowing the European bailouts to continue. Apple unveiled its latest iPhone as the stock sits near all time highs. Both events did not inspire the markets to do much other than digest as they awaited the Fed’s 12:30pm announcement on Thursday. By the end of the week, the markets will have digested the ECB’s latest pledge to buy European debt in a HUGE way, Apple’s new phone, the German court ruling and the Fed’s latest plan for more money printing. Now that’s a month’s worth of news in one week! As I wrote about in last week’s Street$marts, http://www.investfortomorrow.com/newsletter/CurrentStreet$marts20120905.pdf, the market was following the more bullish of the two bullish scenarios I spelled out. At this point, it may get really interesting with all time highs in the Dow just under 1000 points away! In the next issue of Street$marts due out next week, I will review the various canaries in the coal mine and see how they are behaving. After Ben Bernanke gave the market little to cheer for on Wednesday, his European counterpart, Mario Draghi, and the ECB left interest rates alone and disappointed investors who were hoping for a follow up from his bold statement last week. Draghi did indicate that massive bond purchases would resume again, but that was more than expected. Draghi better deliver quickly or his credibility will certainly suffer. Could he have put his foot in his mouth without speaking with the Germans first? Friday at 8:30am brings the monthly employment report and the market has reacted negatively for most of the past year. What’s interesting right now is that while the market reacted negatively to the Fed’s and ECB’s lack of action on Wednesday and Thursday, the net result could have been much worse with stocks closing right in the middle of the range today. I have never been a big fan of betting on the outcome of an economic number and how the market will react, but IF the losing streak on employment Fridays was going to be broken, the stars are lined up to do it. In my bi-weekly interview with my friends from ET NOW in India, I continue to share my long-term view that Europe’s debt problems are not going away anytime soon. Although that may seem bad on the surface, markets have a way of discounting known and anticipated news into current prices. Remember 2008? Who could forget it?!?! The stock market turned down long before the economy and news. And right at THE bottom in March 2009, the news was about as bad as the modern investing generation has ever seen. For now, Europe’s problems are known and somewhat expected. Any market can pullback 4-8% at any time, but a complete global, systemic meltdown should not be in the cards here. ET Now: What do you want to start with, US economic data, Goldman Sachs earnings or the kind of indications we have got from Citigroup? Paul Schatz: Going into the earnings season, analysts kept ratcheting down and ratcheting down expectations. So the bar was set so low coming into Q1 earnings, that you have to imagine most companies could exceed the bar pretty easily. But as we have always learned in the market, it is not what the news is, it’s how the stocks and the companies in the market react to the news. So clearly after the bell today, after a great day for the bulls on Wall Street, Intel and IBM on a natural high. ET Now: The Spanish bond yield fell and it has been a successful auction at that. Are concerns about what may happen to Spain now receded? Paul Schatz: No, I think this is almost a daily soap opera. One day we are worried about yields going 6-7% higher, the next day the auction goes well. This news has been with us for more than a year and once we get by Spain, if we get by Spain, it will move to Italy or it will move to France, where we get the French elections. So these kinds of European sovereign debt woes are going to be with us not just for days, weeks and months but we have got years to deal with this.